What will be your Miura? Innovation has been part of the human story since before the invention of the wheel. There is nothing new about innovation but, as someone born before the invention of the pocket calculator, I can say with some authority that one thing has changed in recent times: the pace of change. Significant innovations that used to come along every four or five years are now coming along every four or five months. It took more than one hundred years to get from the invention of the phonograph in 1877 to the introduction of the CD in 1982. Since then we’ve seen wave after wave of new technology and the launch of music streaming services which have changed the way we buy and listen to music and even the structure of the music industry itself. The pace of change continues to accelerate, with the emergence of AI enabled devices, like Amazon’s Echo, which are starting to change the way we think about music. Everyone in business today is familiar with the competitive pressure arising from this increased pace of change. It’s a particular challenge for big business but it affects us all. So what is the secret to the quick and effective introduction of new ideas, products and services? In 1965 Lamborghini’s flagship car was the beautiful 350GT, a front-engine, rear wheel drive “Grand Tourer” designed to compete with the finest cars offered by Lamborghini’s great rival Ferrari. The 350GT was Lamborghini’s first production car and established the company as a serious manufacturer. But, in 1965, something amazing happened which would come to redefine the Lamborghini brand and bring us some of the most extreme and exotic supercars imaginable, including the Countach, Diablo, Murcielago, Gallardo, Huracan and Aventador. The development team responsible for the 350GT was led by the talented engineer Gian Paolo Dallara and included two equally talented engineers Paolo Stanzani and Bob Wallace. Although primarily responsible for Lamborghini’s one and only flagship product – the 350GT – Dallara, Stanzani and Wallace also had an idea for another truly innovative vehicle: a mid-engine, road-going, race-bred car. This idea was entirely at odds with the direction Ferruccio Lamborghini had set for his company. Unable to convince Lamborghini this was a good idea or that it wouldn’t be too expensive or too much of a distraction from the company’s main focus, they did what mavericks always do: they did it anyway. They worked on the design in their own time, in the evenings and through the night – eventually persuading Ferruccio to give them a free hand to develop the car as a marketing exercise. By the time of the 1965 Turin motor show, they had a rolling chassis (but no body) which was sufficient to secure some initial orders. 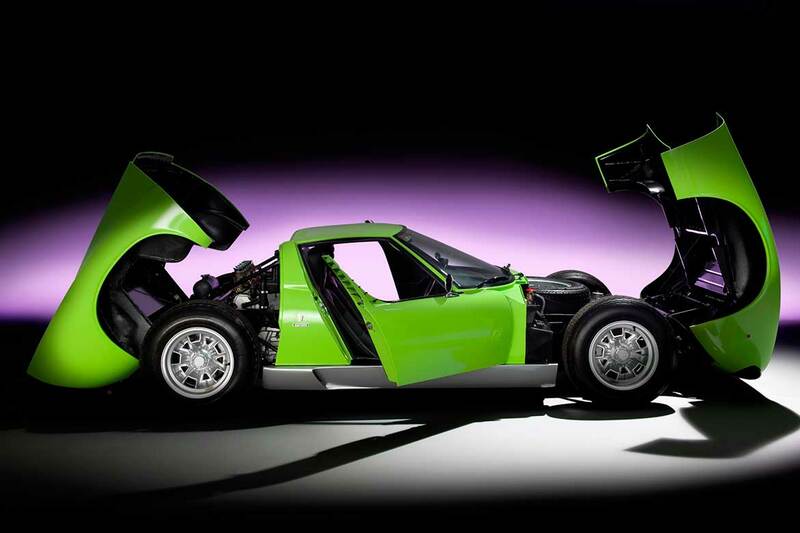 Marcello Gandini at Bertone was then commissioned to design the body, which he did to stunning effect. This was ready just in time for the 1966 Geneva motor show (although the engine had to be left out as it wouldn’t fit under the clam shell). The favourable reaction in Geneva persuaded Lamborghini to put the car into production and thus was born the famous Lamborghini Miura, the fastest production car of its time and the prototype for every subsequent Lamborghini extravaganza. What I love about this story is how clearly it illustrates the role experimentation plays in bringing new ideas to market. This was not a carefully considered and evaluated idea. It was not executed to a detailed plan. It was trial and error all the way. At the Turin motor show the car had no body; at the Geneva show it had no engine. And it was still really only a prototype when it went into production. But it went on to define the company. The second thing it illustrates is the role of the mavericks; in this case the three talented engineers who gave up their own time and worked outside their normal constraints to bring their idea to life. I see this time and again – passionate, talented people who ignore or work around the rules to pursue their own ideas, quickly and cheaply.